A fireplace is the historical absolute center of any home – the place the supplies light, heat and a focus for family or community even in the darkest and coldest of winter days. 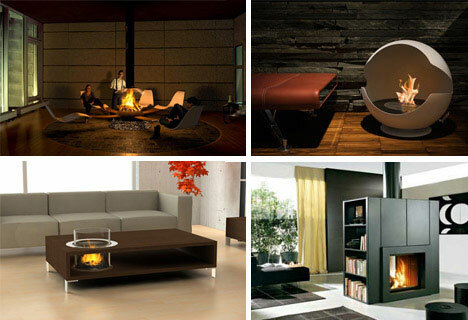 From portable suitcase fireplaces and rotating remote-control ones to coffee table, bookcase and other multifunctional designs, here are thirty incredible fireplaces fit for the heart of any modern home. Need fire on the go? The Travelmate Fireplace Suitcase slices, it dices … OK, it does neither of those but it does provide the potential for romance on-the-go, weighing just 55 pounds and powered by eco-friendly bio-ethanol. The flame will last up to 3 hours and the slick black case is weather-resistant, working just as well outdoors as indoors. Can’t take it with you? 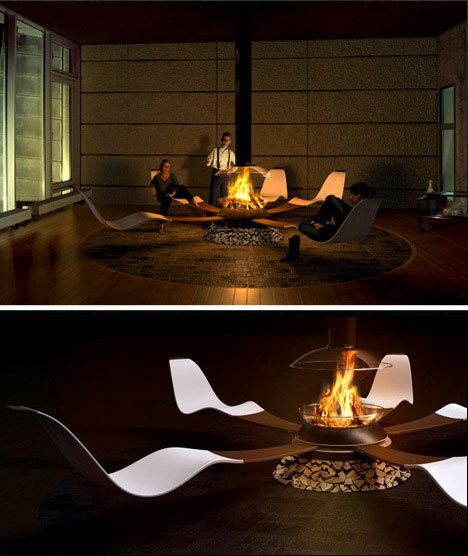 Th rotating Diva fireplace spins on an axis at your command – and even comes with an (optional) remote control so you can twirl it from afar. 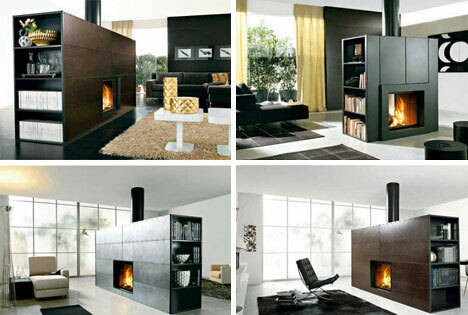 Leave it to German engineers to make a sleek, directional modern fireplace design that you can smoothly adjust to face you for extra light and warmth. 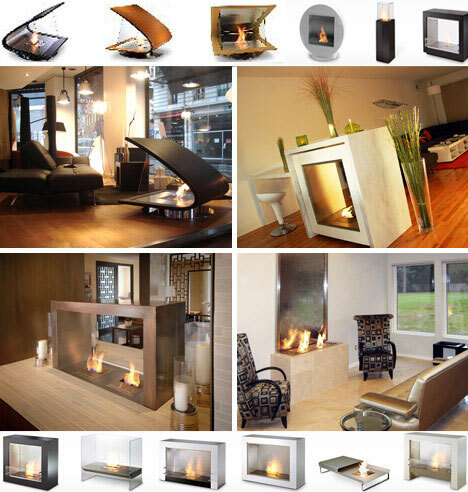 And if you really like getting up close and personal with your family room fireplace you may be interested in a Planika design – many of which are integrated with everything from glass side tables to granite, wood or steel coffee tables. While these may seem dubious in terms of their safety they are also compellingly central. Greed for Quiet is a brilliantly simple concept with a remarkably elegant execution – connect people directly to the hearth of a home by connecting their chairs to the fireplace. 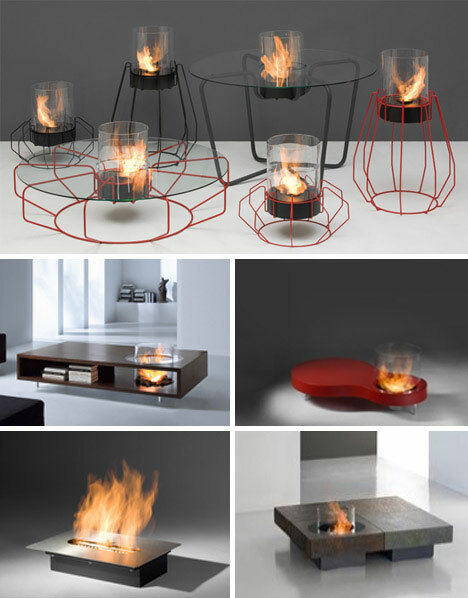 The seats rotate around the central fire, allowing for various conversational configurations, while simultaneously all pointing toward the center. EcoSmartFire has an extensive line of clean-burning fireplaces that require no fuel hookup and burn cleanly without a flue. 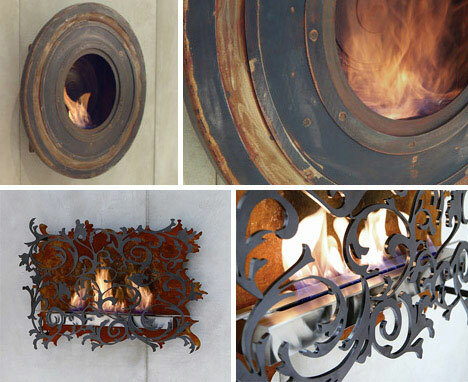 They are open, stylish and versatile in a way few fireplaces have ever been before. Why support a vase on a wall table or cover your coffee table with books or a fish tank when you can have your own ever-changing open flame to gaze at (the books can always go below)? These designs play with reflectivity, simplicity of materials and are easy to locate and relocate as needed as a small part of the larger collection of designs by Radius. 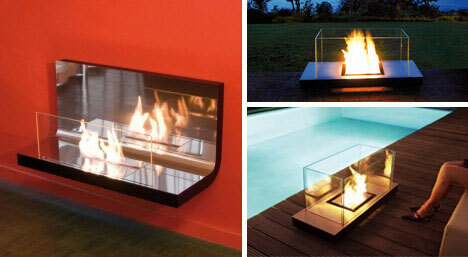 Not every brilliant fireplace design has to be highly central in your home. These elegant metal-and-glass various by Vauni are portable, beautiful and as adjustable as they need to be to serve their purpose. 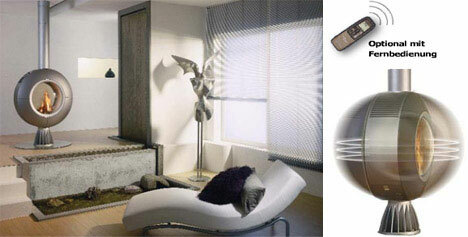 They can be put on the floor or elevated and are suited to most residential or even office spaces. 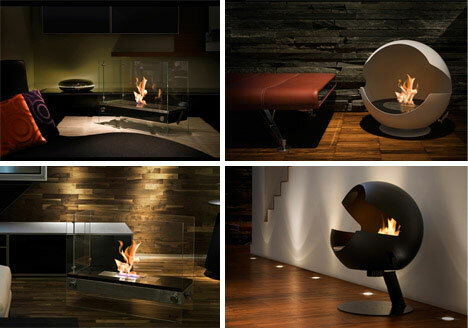 It isn’t just a fireplace design that makes for a wonderful fire – the fire itself can be designed to twist and burn in different ways like the cyclonic fires shown above that spin and rise with internal air differentials. At thousands of dollars a pop these might be more fad than function, however. 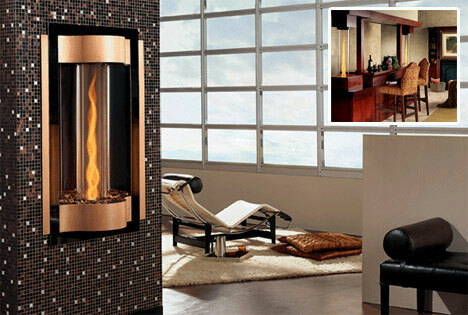 Need to justify the expense of a fancy fireplace with additional functionality? These clever bookcase fireplaces double as handy storage while also providing a spacial center to and divider within a living room. They also come in a variety of finishes, from wood laminate to shiny metallic ones. For more multifunctional book strorage check out this creative modern and transforming bookcases and bookshelves.